This giveaway is for two Plushy Moon Maternity/Nursing Pillows from Theraline, worth £23.95. Each winner can choose a colour of their choice. The Theraline Plushy Moon is unbelievably soft and cuddly and is perfect to use when relaxing. It is an easy to carry pregnancy and baby feeding pillow, making it ideal if you already have a larger pregnancy and baby feeding pillow at home, but like to use one when you’re out and about. And if you‘re tall, its special shape enables you to elevate your baby’s head higher than you would normally be able to when using some of the other smaller nursing pillows available. What more could you ask for! 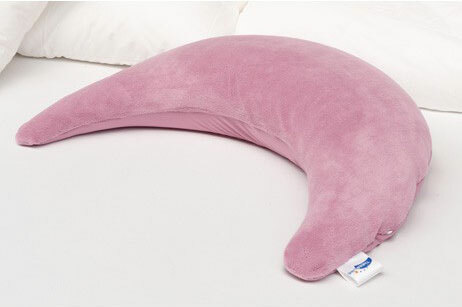 Cuddly terry cloth plush combined with ultra-flexible stretch cotton and filled with the fine sand-like original micro beads creates a really comfortable pregnancy and baby feeding pillow never experienced before. What colour plushy moon would you choose? Thank you for entering, good luck! This competition ends on 21/10/13. There will be two winners for this giveaway. Grey..don’t know why but it seems like a sleepy, calming colour?